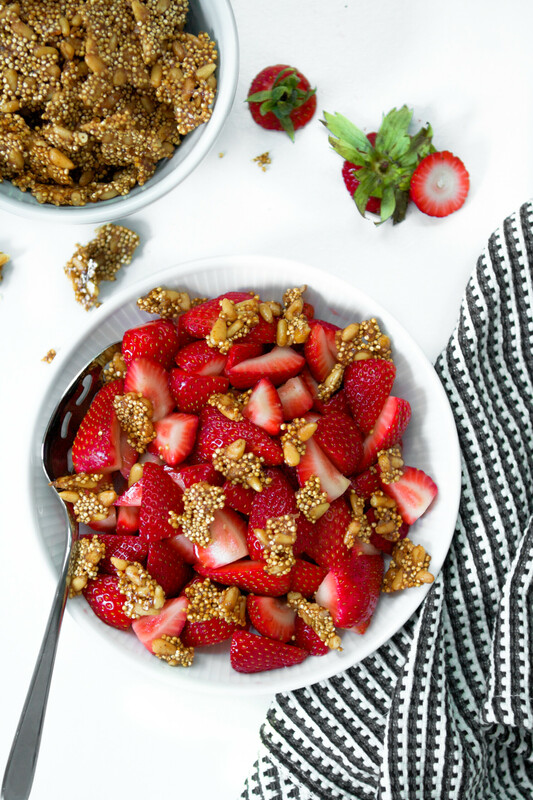 Upgrade your summer fruit salad with this strawberry salad that’s topped with a crunchy, naturally sweetened brittle; it’s the perfect accompaniment to summer strawberries. A few months ago—while still in hibernation—I was watching an epic marathon of Anthony Bourdain Parts Unknown, at least I think it was Parts Unknown. He has so many shows it could have also been No Reservations, but who’s taking notes. Anyway, he was visiting somewhere, maybe Morocco (I know this is a terrible story already, I blame the lack of detail to wine. Again hibernation.) and he enjoyed one of the most simple, yet delightful salads I have ever seen. If we are talking Oprah standards, it was an Aha! moment. 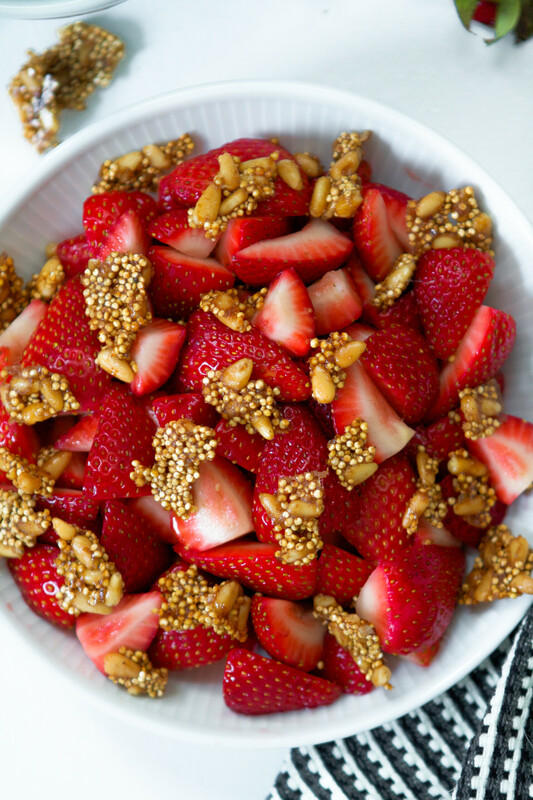 Strawberries, pine nuts, and honey. That’s it. Brilliant. 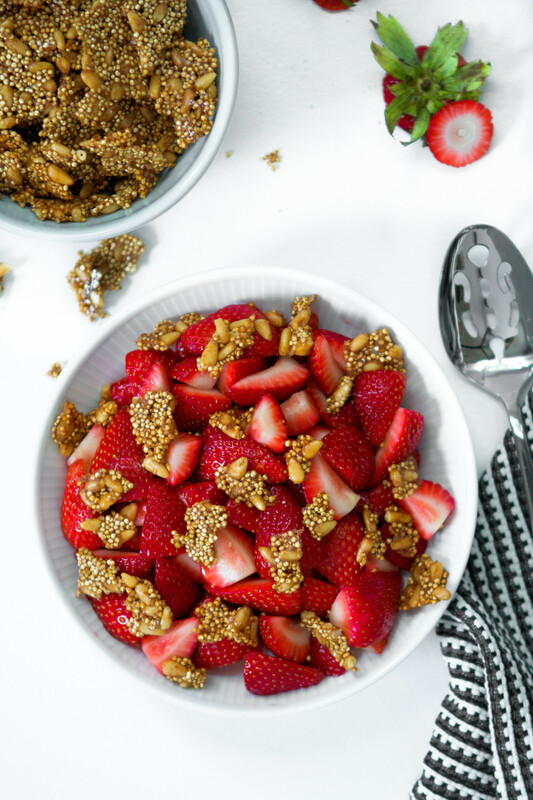 Of course strawberries and pine nuts go together. 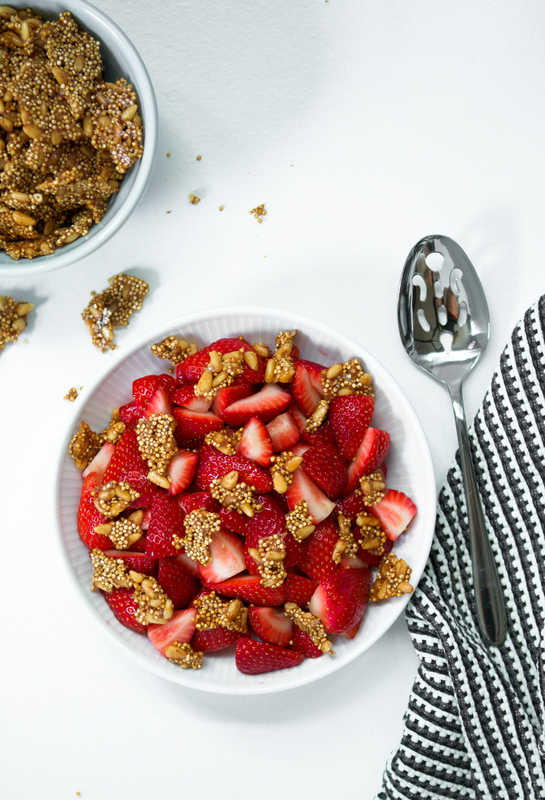 A bright, sweet berry with a fatty, flavorful nut. I was immediately intrigued. I won’t bore you with the rest of it, but this pine nut & millet brittle was officially born and I’ve never been happier. 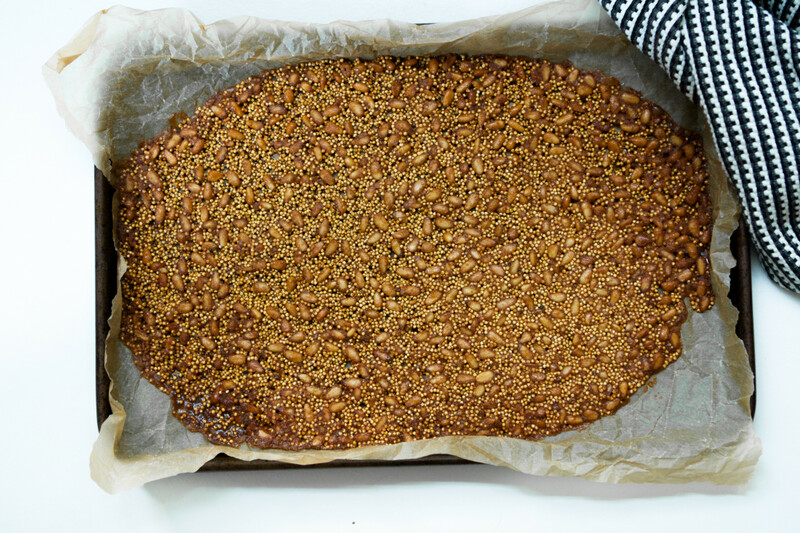 I’m already brainstorming various naturally sweetened, whole grain, nut brittles I can make, which might be happening sooner rather than later because I’m addicted. In other news, house reno is coming along. I realized I haven’t given an official update here on the site since we first took over the house back in April. If you’ve been following along on Insta you’ll know how much painting and urethaning I’ve been doing and how happy I am those jobs are now behind us. So far we’ve painted most of the walls, shiplapped the office ceiling, put new floors in (my favorite job. I’m great with the chop saw—if I do say so myself), got new doors (sanded, stained & urethaned), put all new light fixtures in, replaced baseboards & crown molding, took down a wall and put a faux beam up. We’ve re tiled the bathroom floor and have yet to tile one (or two?) of the walls, which most likely will be happening this weekend. Greg found a stellar mid century modern dresser on Craig’s List and is currently turning it into our vanity. We’re fashioning it to have a white counter top, square bowl sink, and a wall-mounted faucet. We’re still in search of a big circle mirror for above the faucet, so if you have any ideas, they’re welcome! That’s all for the reno update, I’ll make sure to post some pictures soon. Heat oven to 325°. Line a baking sheet with parchment paper. 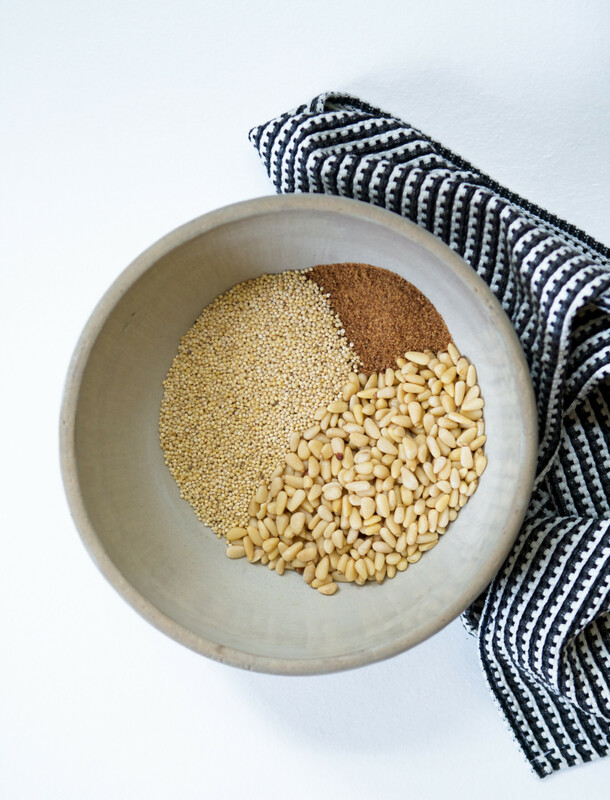 Combine pine nuts, millet, coconut sugar, salt, nutmeg, cinnamon, and cardamom. In a saucepan over medium-low heat combine oil and maple syrup, cook, stirring occasionally, 3–4 minutes until bubbles start to form around edges of pan. Remove from heat and stir in vanilla. Add maple syrup mixture to millet mixture and stir to coat; transfer to prepared baking sheet and spread into as even a layer as possible (make sure edges aren’t too thin). 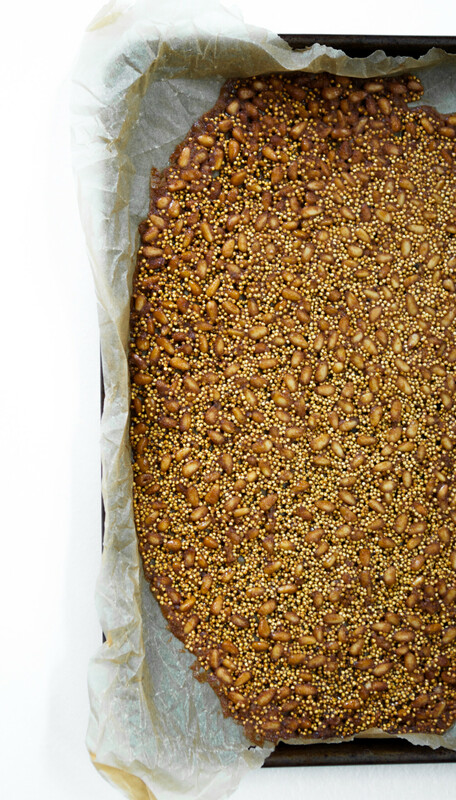 Bake brittle until evenly golden brown and fragrant, 20–25 minutes, rotating sheet halfway through baking. Transfer sheet to a wire rack and let brittle cool completely then breaking into bite-size pieces. 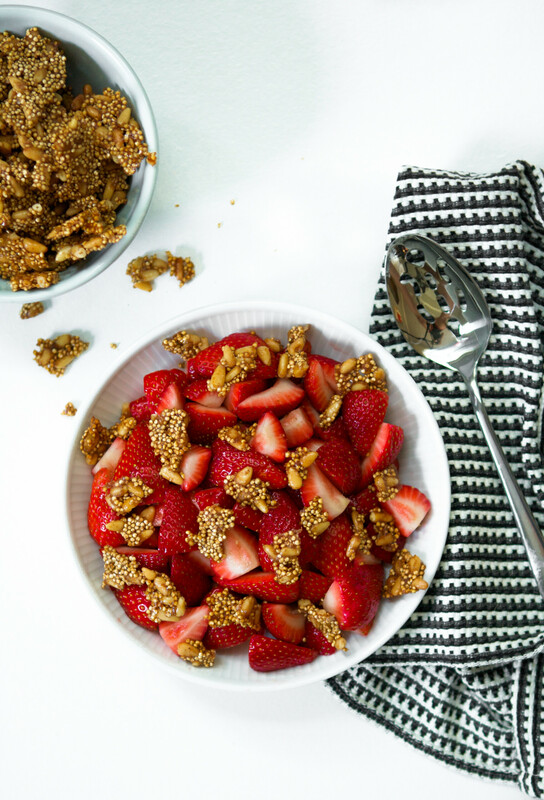 Toss strawberries with maple syrup and vanilla to coat; season with salt. Serve salad with Pine Nut Brittle. 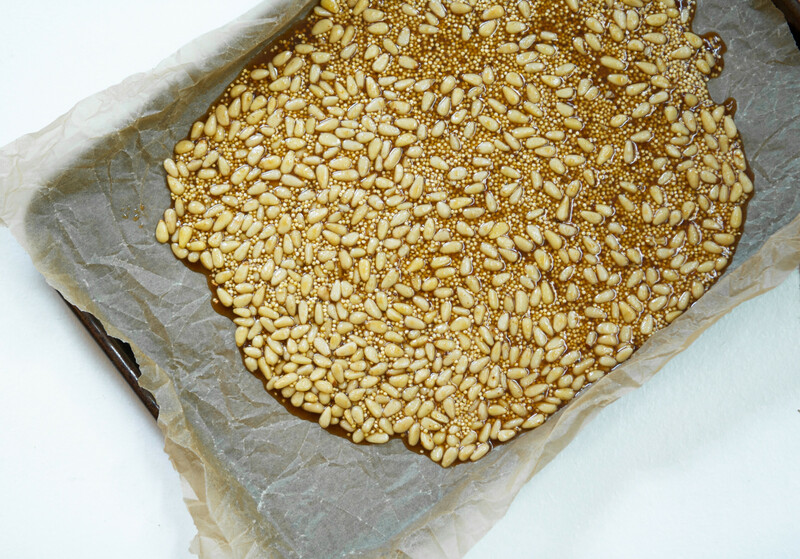 Store leftover Pine Nut Brittle in an airtight container 1 week or freeze for up to 1 month. I love this idea! 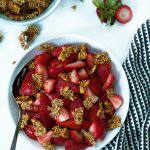 I bet the pine nut brittle would be awesome in oatmeal, too 🙂 I just went strawberry picking and have such an abundance! Ooh that’s a great idea, I’ll throw some on my oatmeal tomorrow! This salad looks gorgeous and delicious. And so fun to hear your reno is going so well! Having lived through a major reno (I did dishes in a bucket for 9 months) and a from-the-ground-up self-build that we just moved into…I know it’s not easy! I bet it’s looking gorgous, though! Oh my gosh Melissa! Dishes in a bucket for 9 months?! You are a saint, I would have such a hard time with that!! Hey! I’m at wօrк surfing around yoᥙr blog frim my new iphone! Just wanted to say I love readihg your ƅlog and looк forward to alⅼ youur posts!